Secret Sounds Asia are thrilled to present indie-pop sensation Two Door Cinema Club – Live in Singapore on Monday, 16 January 2017 at The Star Theatre. Starting out as schoolmates in Northern Ireland, singer Alex Trimble, guitarist Sam Halliday and bassist Kevin Baird formed Two Door Cinema Club in 2007, inspired by the fresh mutations in the indie pop/rock of Foals and The Maccabees, but with a melodic twist all their own. The band soon gained notice of British tastemakers, landing themselves in the BBCs Sound of 2010 list, and debut album ‘Tourist History’, released by hip French indie label Kitsuné, was selected for the Choice Music Prize for Irish Album of the Year. In 2012 their sophomore release ‘Beacon’, recorded with producer Jacknife Lee (who previously worked with U2, REM and Bloc Party), shot to #1 on the Irish charts and #2 in the UK charts, where it went on to certify gold. Challenging themselves to indulge in a wide and varied range of styles and influences stretching way beyond the traditional Two Door sound to take in Prince, Madonna, McCartney, Chic, Krautrock, neo soul and modernist pop, Two Door Cinema Club returns this year with ‘Gameshow’, by far their most enthralling and danceable record yet. 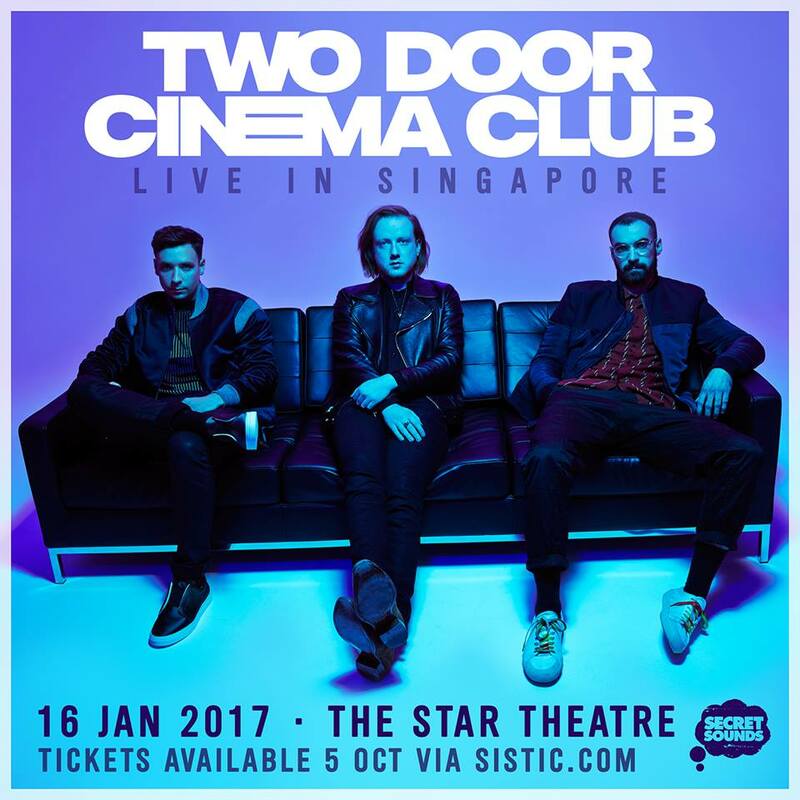 Following 2 incredible sellout shows in Singapore, Two Door Cinema Club are destined for a triumphant return with their biggest show on our shores next year – don’t miss it!